Voivod is a Canadian heavy metal band from Jonqui�re, Qu�bec. Their musical style has changed several times since the band's origin in the early 1980s. 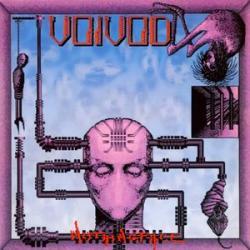 Starting out as a speed metal band, Voivod have added a mix ofprogressive metal and thrash metal to create their own unique metal style. Since their debut record in 1984, Voivod have released eleven studio albums as well as one EP, one live album, two compilations, seven demos and one DVD featuring a live concert. The band found mainstream success in the late 1980s with the album Nothingface (1989), which was the first Voivod album to enter the Billboard 200 charts, peaking at number 114. Voivod's most recent studio album is 2013's Target Earth, their only album with the lineup of Snake (vocals), Chewy (guitar), Blacky (bass) and Away (drums).